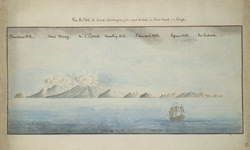 View of the island of St Christopher, more commonly known as St. Kitts, by Alexandre Moreau de Jonnès. The island is about 68 square miles in area, and dominated by a range of mountains which rise steadily in height from east to west. A volcano, known as Mount Misery, can be seen to the left of the painting.